In her first Octagon appearance since getting submitted by Rose Namajunas back at UFC Fight Night 80, Dancing With The Stars runner-up Paige VanZant looked to regain her Strawweight promise in a matchup with striker Bec Rawlings earlier tonight (Sat., Aug. 27, 2016) at UFC on FOX 21 from Rogers Arena in Vancouver, British Columbia, Canada. The always aggressive VanZant came out with a flying kick before settling down and taking her time against the skilled Rawlings. After closing the distance on VanZant, Rawlings was able to land some solid shots inside. VanZant continued to stay light on her feet, circling away, making “Rowdy” chase her down and jumped in-and-out of the pocket with quickness. In order to sustain her own pace, Rawlings spend much of the first round standing in the center of the Octagon. To begin the second round, VanZant came out firing. She landed a vicious flying head kick that stunned Rawlings and sent her to the canvas. The Team Alpha Male standout followed up the flashy switch kick with a few strikes to the side of Rawlings’ head to earn the memorable second-round knockout win. 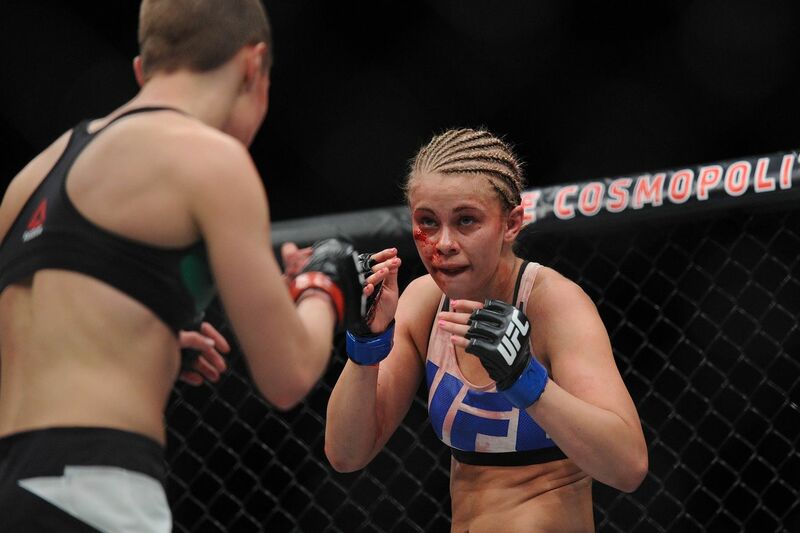 This is arguably VanZant’s most prominent UFC victory to date. While Rawlings was’t an immediate title contender at 115 pounds, she’s a proven veteran who offers serious danger inside of the cage. It was quite the showing, and finish, for VanZant as she returns to prominence in the Strawweight division. MMAmania.com is delivering LIVE round-by-round, blow-by-blow coverage of the entire UFC on FOX 21 fight card RIGHT HERE, starting with the UFC Fight Pass “Prelims” matches online, which are scheduled to begin at 5:00 p.m. ET, and then the remaining undercard balance on FOX at 6 p.m. ET, before the FOX main card start time at 8 p.m. ET.